Periodically, the Suffolk Owl Sanctuary acquires a new species of bird in order to give visitors access to as many owls and other birds of prey as possible. The diversity of birds now resident at the centre expands the knowledge of the falconry staff and also enriches the visitor experience, so staff are always ready to rise to the challenge of a new arrival. On 29th. February - Leap Year Day!! 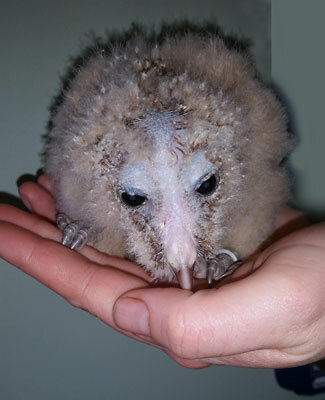 - little Taino, the Ashy-faced Owl became the latest addition to the sanctuary “family”. This hand is so warm, I might just nod off again! At just three weeks old, on arrival with us Taino was hand fed by the falconers every three hours. Just like any other baby, his demands were few… food and warmth! So to begin with, he spent time in incubator with his teddy bear for company, awaiting tweezers of meat! Since then he has grown rapidly, as all young birds do. Within a few weeks from now he will be fully grown and ready to embark on a training programme that will hopefully culminate in him taking a role in the sanctuary’s flying displays. Soon after, the falconers will also be able to ascertain whether Taino really is actually a “he” or whether he is a female of the species! As this is impossible to tell with juvenile birds, “he” is accepted as a working title for the moment! The Ashy-faced Owl is similar in size and appearance to a Barn Owl, but with slightly darker plumage and, as the name suggests, a grey facial disc. Despite the similarities, however, the Ashy-faced Owl is a distinct species in its own right. It is native to Haiti and the Dominican Republic and favours wooded habitat and forests. The rise in the human population and consequent deforestation of these areas has therefore resulted in a drop in native Ashy-faced Owl numbers. Captive breeding programmes of the species originated in Germany about 10 years ago and the Dominican National Zoo and the Society for the Conservation and Research of Owls responded by initiating a domestic breeding project in the Dominican Republic to ensure the conservation of this pretty species. The name Taino pertains to an ancient Arawak people who were indigenous to Florida and the Caribbean. During the 15th. century, the Taino were the principal inhabitants of Jamaica, Cuba, Puerto Rico, Haiti and the Dominican Republic.